Scrolling through Facebook these days is an easy way to learn a lot -- perhaps too much -- about your friends' political leanings. Granted, some of it's not that surprising. Your high school friend who studied gender theory at Oberlin is gung-ho about the Jill Stein recount? Duh. Your racist uncle Larry is sharing "news" stories claiming Hillary Clinton is a lesbian werewolf? Sure. But what about your friends who keep their political preferences under the radar? What pages are they liking, what kind of news are they reading? And how one-sided is your Facebook feed? A slick new browser extension called PolitEcho reveals detailed information about the political leanings of all your Facebook friends. Once you download it (here), it'll tell you if the guy you just started dating has an affinity for FOX News, or if your tight-lipped corporate boss is secretly a Green Party hippie. More importantly, it shows you how much of an echo chamber your News Feed actually is -- which, if you're among the 44% of Americans who get their news only from Facebook, might be pretty damn illuminating. Developed during last month's Facebook Global Hackathon Finals, PolitEcho is a browser plugin (available on Chrome, for now) intended to help you better understand what kind of political bubble you exist in. Facebook itself already predicts your political preferences, but that intel is private and only visible to you and (surprise! ) advertisers. 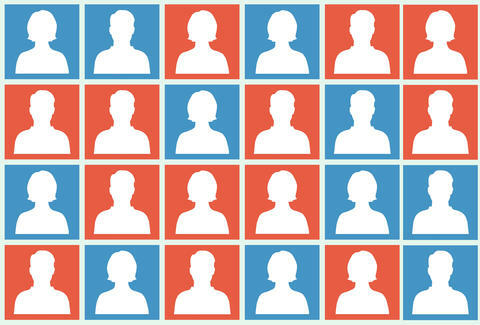 PolitEcho brings that info to the forefront so you can see who in your social circle skews politically left or right. PolitEcho discreetly scans all of your Facebook friends' profiles and takes note of all the outright political pages a person has liked. Then it looks at all of the other pages they like -- say, the New York Times, or The Onion, or Thrillist -- and compares them against a database of sites that have been rated for a liberal or conservative bias. Finally, it assigns each person a total numerical "score" and plots them on a graph somewhere between very liberal to very conservative. 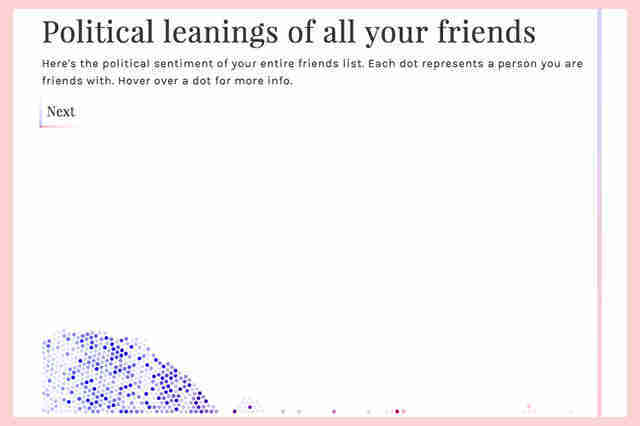 Hovering over each dot on the graph reveals which friend of yours it represents, and provides a list of the sites that person liked that factored into their score. It'll also let you know how confident PolitEcho is in its prediction, assigning it a "low," "moderate," or "high" confidence rating. Keep in mind that if your friend has their privacy settings set to "only me" under "who can see the people, pages, and lists I follow," they won't be included in the graph. Besides pulling back the curtain on the potentially surprising political sentiments of your friends, PolitEcho is worth downloading because it reveals how much of a filter bubble your News Feed is. It creates a second graph, this time plotting how often certain friends show up in your News Feed, and where they lean politically. 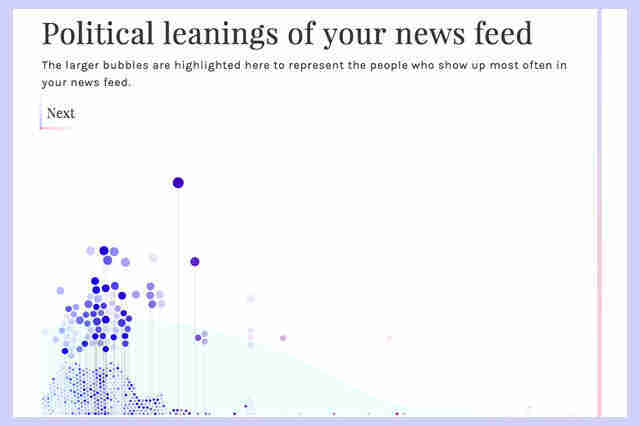 Look for where the densest clusters and highest-marking dots fall on the spectrum -- that's a pretty good indication as to whether your News Feed skews liberal or conservative. 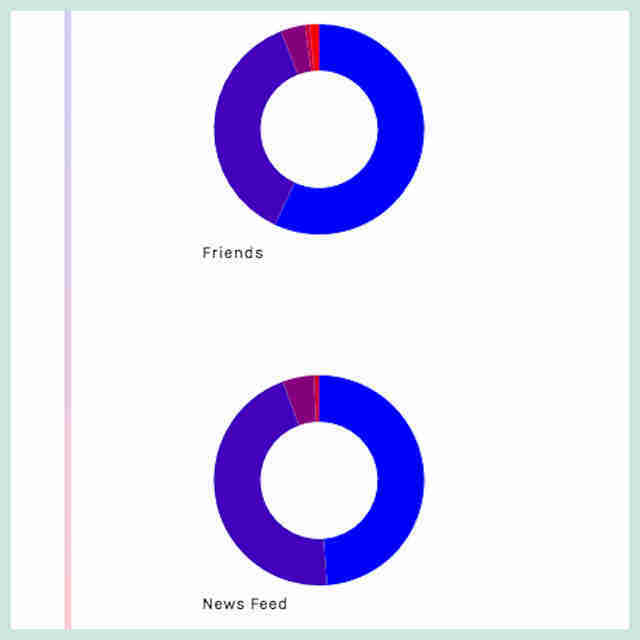 And just in case you were confused by the graphs, PolitEcho also provides a third visualization in pie chart form, breaking down both your friends' individual political sentiments and how they influence your News Feed in more clear-cut terms. The best part? You can share all of the results on Facebook. Joe McGauley is a senior writer for Thrillist and would be lying if he hadn't considered logging off Facebook for good a lot lately.